Pictures that show a purported next-generation iPhone prototype feature a screen size and design that appears largely identical to the current iPhone 4. 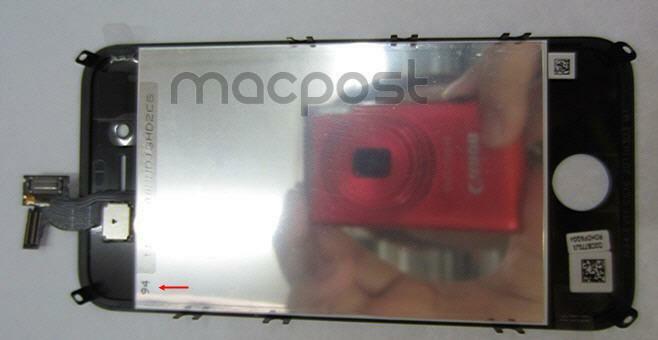 The details come from an LCD display and digitizer component obtained by MacPost. The LCD component is labeled as "N94 EVT 1," which indicates it is an iPhone prototype that was in the Engineering Verification Testing phase. The component carries a manufacture date of March 3, 2011. That indicates the prototype is older than the "EVT2" handset that was pictured last week, which carried a manufacture date of June 7, 2011. Both the components from last week, which featured a back panel, and this week, with the front LCD, show a design unchanged from the current iPhone 4. Reports have been conflicted as to whether Apple's fifth-generation iPhone will look similar to the iPhone 4, or if it will feature a new design. Some speculation has suggested Apple will update the iPhone 4 to a model dubbed the iPhone 4S. The new hardware could serve as an entry-level model, much like the 8GB iPhone 3GS sells alongside the current iPhone 4. If that's the case, the components revealed Monday could be from a new iPhone 4, rather than a full-fledged fifth-generation iPhone. One report from earlier Monday suggested Apple's so-called "iPhone 5" will sport a metal chassis that will replace the glass back of the iPhone 4. However, one report last week from Reuters cited anonymous sources who indicated a fifth-generation iPhone will have a design largely identical to the current iPhone 4. Those sources reportedly said the handset will have a slightly bigger touchscreen, along with a better antenna and an 8-megapixel camera. Further confusing matters, a number of third-party cases have appeared in China showing a fifth-generation iPhone with a new design. Those cases show a handset with angled sides and a flat back, similar to the structure of the iPad 2.